Jacob gave me goosebumps every other page. Things that you think you've gotten over or buried deep enough to forget, Jacob finds her way in and opens you up again (in the best way). This is the graphic memoir I never knew I needed. Jacob writes about growing up as a woman of color in the southwest, about navigating the fraught relationships with her white in-laws, and about raising a biracial son in New York during the Trump era. Good Talk is amazing, I cried, more coherent review to come later. Told with humor and a blunt honesty I love, Mira Jacob’s graphic memoir is really a memoir in two parts: Part one is Mira growing up in New Mexico in the 80’s and 90’s, wrestling with her own questions and experiences regarding race, sexuality, and love. Part two focuses on our country in its current political climate as her son begins to question everything from Michael Jackson’s changing skin color to why Trump would be angry at him for being brown. Very serious topics, but everything Mira Jac Told with humor and a blunt honesty I love, Mira Jacob’s graphic memoir is really a memoir in two parts: Part one is Mira growing up in New Mexico in the 80’s and 90’s, wrestling with her own questions and experiences regarding race, sexuality, and love. Part two focuses on our country in its current political climate as her son begins to question everything from Michael Jackson’s changing skin color to why Trump would be angry at him for being brown. Very serious topics, but everything Mira Jacob put down was easily accessible and 100% understandable - funny but with a deeper emotional content. The best book about race relations I’ve ever read. Read it now. A really honest and introspective look at many sides of discussions be it for race, gender, and simply what it means to live in America when you're not always seen as an American. Some of the best books are as honest as can be in the difficulties of larger conversations and just being, and they make you think long after you've turned the last page. GOOD TALK is one of those books. It is amazing to me how much Jacob fits into this book, how much it manages to contain, and how much it says not just about Jacob herself but about the present moment we live in. This is not just a book about raising a precocious biracial child in a world that treats his two parents very differently, that is just an entry point for Jacob to examine all the different parts of her life where these difficult issues have come up. The parental anxiety factor here is high and I felt it really deeply. It is amazing to me how much Jacob fits into this book, how much it manages to contain, and how much it says not just about Jacob herself but about the present moment we live in. This is not just a book about raising a precocious biracial child in a world that treats his two parents very differently, that is just an entry point for Jacob to examine all the different parts of her life where these difficult issues have come up. The parental anxiety factor here is high and I felt it really deeply. My kids are close to the age of Jacob's son, and while they don't have his particular precocious awareness of the world, even if your child doesn't ask you these questions directly you still have to think about how to have conversations with your kids about things your parents may have never talked about with you. Jacob jumps through time to her own childhood in mostly-white Albuquerque: the colorism of her Indian relatives, her own lack of awareness and built-in biases; her adulthood in Brooklyn: the fears of 9/11, her frustration with her family's desire that she marry a certain kind of Indian man, her work as a writer, and parenthood. There are all kinds of small stories but they meld together to make something really meaningful and resonant. The slow pace of writing and publishing means we still don't have many books that look at the anxieties of the Trump era, Jacob's does it so effectively, capturing her own fears, the often-unusual worries of her son, and the contrast between those and her white husband's family. Mira Jacob has really written - and drawn - a memoir for our times. Jacob, the author of a marvelous novel, "The Sleepwalker's Guide to Dancing", published in 2014, has written "Good Talk: A Memoir in Conversations", a graphic work using text, drawings, and photographs to try to distill some of the angst in our society brought on by the election of Donald Trump in 2016. But the angst that Jacob felt for her and her young son actually began years before as the American-born daughter of Indian imm Mira Jacob has really written - and drawn - a memoir for our times. Jacob, the author of a marvelous novel, "The Sleepwalker's Guide to Dancing", published in 2014, has written "Good Talk: A Memoir in Conversations", a graphic work using text, drawings, and photographs to try to distill some of the angst in our society brought on by the election of Donald Trump in 2016. But the angst that Jacob felt for her and her young son actually began years before as the American-born daughter of Indian immigrants to the United States. Jacab's story goes back and forth between 2016 and times before. When we flash between the present and the past, the transitions tend to deal with how Jacob has faced a sense of alienation about her darker-than-blonde-blue-eyed looks. (It's probably good that she grew up in Albuquerque which is a pretty good melting pot. Edina, Minnesota, say, might have been a bit tougher.) Her skin was a bit darker than her parents and older brother, which brought on non-PC comments from her Indian relatives, who emphasised the "value" of lighter skin, particularly in the marriage-game. But Mira grew up a smart kid - despite some incidents - and moved to New York City after college. She met again a young man who'd grown up with her in New Mexico, they married, and had a son. Her husband was Jewish and so, of course, the boy was a combination Jewish and South Asian. Much of the book is devoted to trying to understand her son's fears of the world around him as Donald Trump emerges as first the Republican candidate for President, and then, as the elected president. "Z", her son, sees his paternal grandparents as Trump supporters and worries they won't love him. Jacob and her husband walk the fine line of respecting his parents without respecting their political choices. There was a lot of that in the nervous time of the election and many of us have reevaluated some of our friendships with others, others who may have voted a different way than we did. First a confession: from the advance blurb (“Who taught Michael Jackson to dance?” “Are white people afraid of brown people?”), my expectations for this book weren’t high. I suspected it might be another one of those feel-good, politically-correct books. But I loved Mira Jacob’s first novel, The Sleepwalker’s Guide to Dancing, and on a whim, I decided to take a chance. And – wow! This is the real deal, raw, wrenching, funny, fearless, and honest. Mira Jacob is an American of Indian descent, marri First a confession: from the advance blurb (“Who taught Michael Jackson to dance?” “Are white people afraid of brown people?”), my expectations for this book weren’t high. I suspected it might be another one of those feel-good, politically-correct books. But I loved Mira Jacob’s first novel, The Sleepwalker’s Guide to Dancing, and on a whim, I decided to take a chance. Using her own illustrations to tell her story, Mira Jacobs walks us through pivotal moments in her back history. She recalls winning an essay contest, sponsored by the DAR, as a child. However, Mira wasn’t quite the “American” the DAR envisioned in granting her the prize. She highlights the “tragedy of my skin color” on visits back to India, where the fairer someone is, the more value they seem to have. She writes humorously about a Boston radio producer who wishes to interview her after her book is published but insists on pigeonholing her characters into some “Asian Indians” that his audience can fully understand. But to me, the most wrenching part was the schism that occurs when her mother-in-law (who Mira loved enough to instantly call “mom”), decides to vote for Donald Trump at the same time that she and her young son are petrified of the racist undertones of his campaign. She asks her husband, “How can they see what this guy is about and support him! He’s stoking religious hatred! Racial hatred! How do they think this is going to affect our lives?” When her husband assures her that they love her, she answers, “You think they’d feel the same about me if I voted for an anti-Semite?” He answers, “They don’t see it that way.” She answers, “But it is that way. 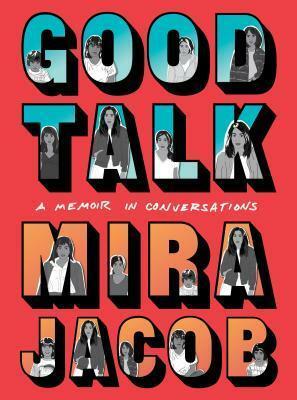 Mira Jacob - I am the author and illustrator of Good Talk: A Memoir in Conversations. My first novel, The Sleepwalkers Guide to Dancing, was a Barnes & Noble Discover New Writers pick, shortlisted for Indias Tata First Literature Award, and longlisted for the Brooklyn Literary Eagles Prize. My writing and drawings have appeared in The New York Times, Electric Literature, Tin House, Literary Hub, Guernica, Vogue, the Telegraph, and Buzzfeed, and I have a drawn column on Shondaland. I am currently the Visiting Professor at The New School, and a founding faculty member of the MFA Program at Randolph College. If I could travel back in time, I would avoid long journeys by boat and take a pair of tweezers. The Sleepwalker's Guide to Dancing is my first novel. Good Talk is my first memoir, and my first drawn book. Apparently I am big on firsts.